I was born in Ireland, but at four years old went to live in Luxembourg. My mother worked with the European Commission and thanks to the European School system, I became a 'true' European. I got my first degree (Sociology) in the University of Glasgow. After that I spent five years in Belgium working in telemarketing, customer service and sales - I learnt a lot of things, but eventually decided that I was not suited for a career in those fields. I made a decision to take a different turn, and went to do a Masters in Social Anthropology of Development with SOAS in London. In 2007 I was awarded a PhD scholarship at the School of Arts & Social Sciences, Monash University Sunway campus. In 2012, I was awarded a PhD for a thesis entitled "The monetisation of personal blogging: assembling the self and markets in Malaysia." I am currently a Lecturer in Communication, also at Monash University, Sunway campus. Please feel free to contact me with any comments or questions about anthropology and blogs. I will do my best to be useful. • Hopkins J. & Lee J. (2012). Thinking Through Malaysia: culture and identity in the 21st century. SIRD, Petaling Jaya. • Hopkins, J. (2012). "From All-Blogs to Blog House Malaysia: SoPo Blogging, Journalism and Politics in Malaysia". In J. Hopkins & J. Lee (Eds), Thinking Through Malaysia: culture and identity in the 21st century. SIRD, Petaling Jaya. • Hopkins, J., & Thomas, N. (2011). Fielding Networked Marketing: Technology and Authenticity in the Monetization of Malaysian Blogs. In D. Araya, Y. Breindl, & T. J. Houghton (Eds. ), Nexus: New Intersections in Internet Research. New York: Peter Lang Publishing. • Hopkins, J. (2012). “Cyberwar and social media: Barisan Nasional’s online presence”. Presented at The 8th International Malaysian Studies Conference (MSC8), Universiti Kebangsaan Malaysia, Bangi, Malaysia. • Hopkins, J. (2011). “‘Responsible blogging’: social-political blogging and blogging associations in Malaysia.” Presented at the International Young Scholars’ Conference 2011, Monash University Sunway Campus, Bandar Sunway, Malaysia. • Hopkins, J. (2011). “Labouring lifestyle: assembling the lifestyle blog.” Presented at the 6th Singapore Graduate Forum on Southeast Asia studies. Asia Research Institute, National University of Singapore, Singapore. • Hopkins, J 2010. 'The Malaysian lifestyle blog: a national blogging genre?' Colloquium: WCU Webometrics Institute at Yeungnam University. Gyeongsan, Republic of Korea. • Hopkins, J 2009. 'Blogging field notes: participatory innovation or methodological dead end? ', Australian and New Zealand Communication Association Conference 2009, QUT, Brisbane, 9 July 2009. • Hopkins, J 2008. 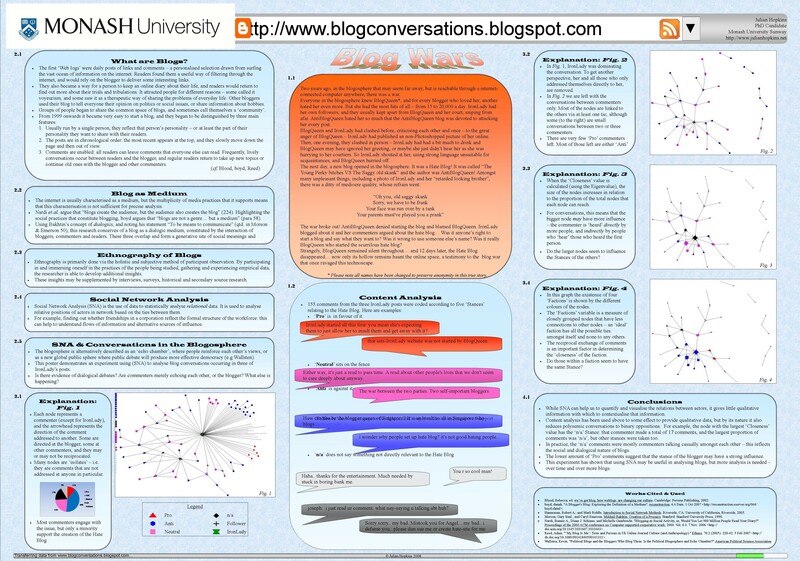 'Blogwars - authenticity and value in the blogosphere', MSC6 - Engaging Malaysian Modernity 50 Years and Beyond, Kuching, Malaysia, 5-7 August 2008. Hopkins, J 2009, 'Media Studies: Blogging and Democratization in Malaysia', review of Blogging and Democratization in Malaysia by Jun-E Tan and Zawawi Ibrahim, M/C Reviews, http://reviews.media-culture.org.au/modules.php?name=News&file=article&sid=3382, viewed November 25, 2009. Providing first and second year American Degree courses in Anthropology, Sociology, Philosophy, History, French and Italian. Additional duties include chairing the Teaching Quality committee, and developing a new Liberal Arts degree programme. Promoted to Senior Lecturer in September 2006.